outie.net Media Portal » Eat » Has anyone tried the ghost chili pepper/sauce? Author: Subject: Has anyone tried the ghost chili pepper/sauce? Has anyone tried the ghost chili pepper/sauce? Does it knock the wind outta off you? My friend has ghost pepper flakes, puts em on everything. Soo good. 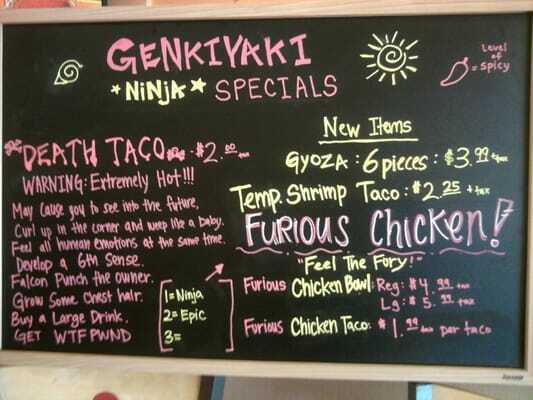 My experience with Ghost Peppers was at a restaurant called Genki Yaki in California. In their menu there is a taco called Death Taco. Its tortilla, kalbi beef, onions, lettuce and the special ingredient Ghost peppers in the sauce. When i first bit this average size taco it was delicious very tangy sweet. I tasted a hint of spice. I reacted like it was nothing it didn't seem spicy at all i thought people couldn't handle this mild spice level. But boy i was wrong as i took another bite the spice kept pounding my tongue like a sledge hammer being smashed into my mouth. For each pound it was like going from spice level 1 to 100. I kept going till i finish literally takes 4 bites to finish this taco. on the 4th bite my head was pounding with pain. The feeling of this spiciness isn't like your typical spiracha. The pain of this spice comes in waves. You'd feel ok for a sec then the next sec you're like omg kill me! My eyes watery, my head throbbing, and my lips plump. it took me about an hour for all these symptoms to go away. It was an experience like no other. But i encourage people to try it. It was definitely something you'd cross off your list of things to do before you die. IN ASSAM, A SLIVER OF northeastern India known for its black tea and one-horned rhinos, lives a squat, baby-faced 32-year-old woman named Anandita Tamuly. In the springtime, sitting in her sparsely furnished cinder-block home, which is adorned with traditional straw hats and a portrait of Ganesh, the Hindu god of good fortune, she produces a binder filled with press clippings and miscellaneous scraps of paper. Among them is a note from Dr. Prabin Bora, an eye surgeon in Jorhat.